Just after seeing the pattern, Endless Summer, for the March LaPetité project, I was on the Fat Quarter Shop site and LOVED this fabric line. With the bouquet panels, I thought it would be perfect to enlarge. 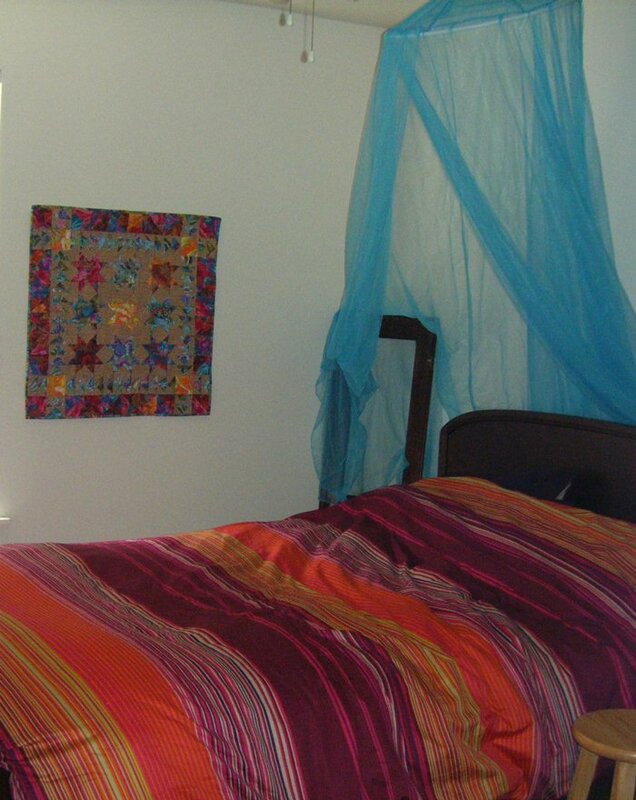 I’d have a spring/summer throw for the couch instead of another wallhanging. 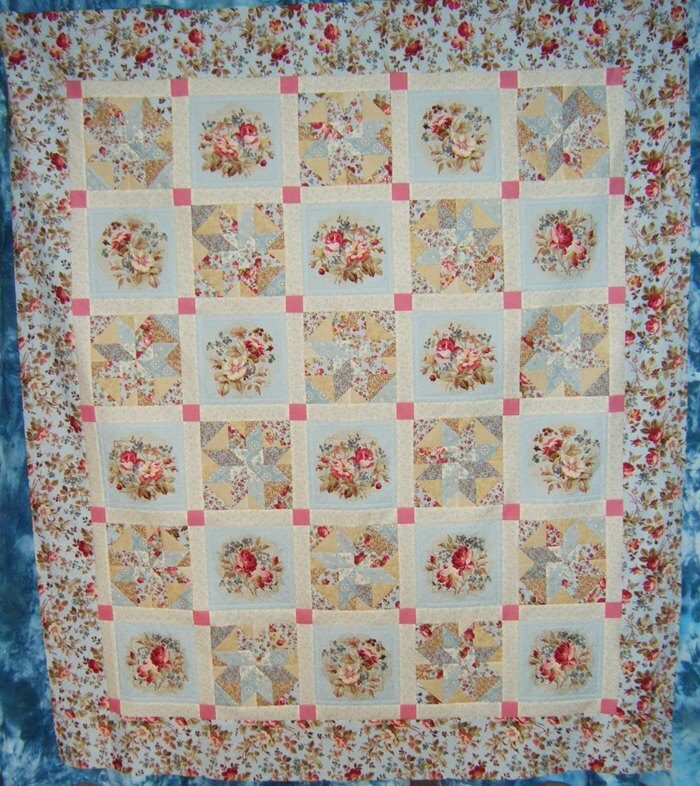 I used the Skye Penelope Fat Quarter Bundle as my fabric that included 1 panel piece. 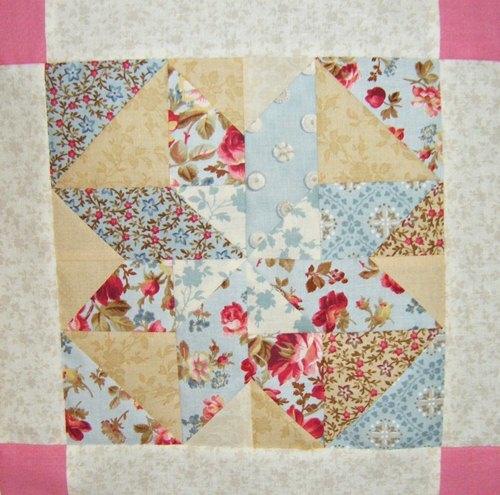 I added coordinating fabrics for the sashing & posts and the border. I mapped out my plan on my EQ7 software and came up with my quilt size and the number of pieced blocks I needed to make. 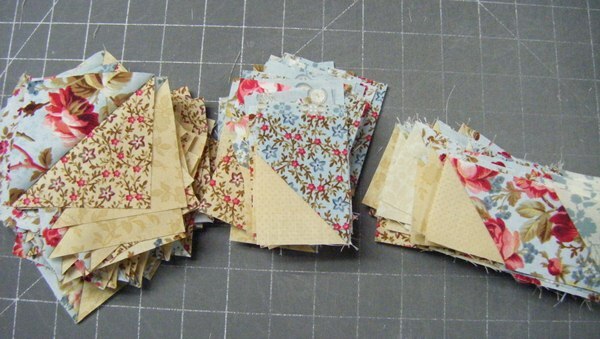 I started the project on National Quilting Day (3/19) and railroaded myself by cutting tooooo many pieces for my pieced blocks which wasted time and fabric. 😦 By the time I had the 15 blocks made… I wasn’t even sure if I liked them anymore!! Argh!! 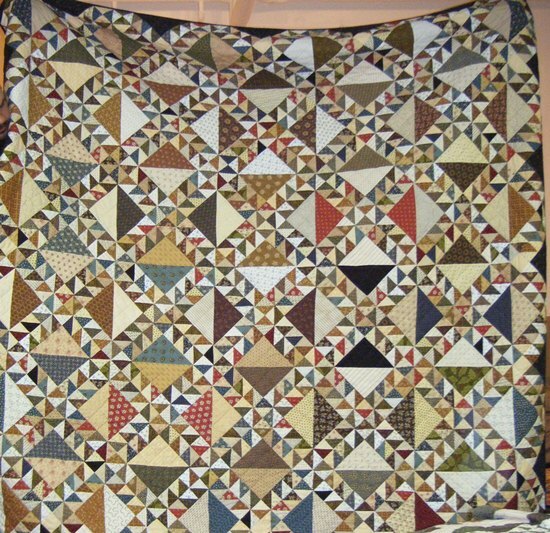 However, I continued on and on evenings I was too tired to quilt, I could piece the sashings or assemble the rows. Over last weekend, I got my samples ready for my upcoming Saturday class. I was finished mid-Sunday so then proceeded to finish my Endless Summer quilt. 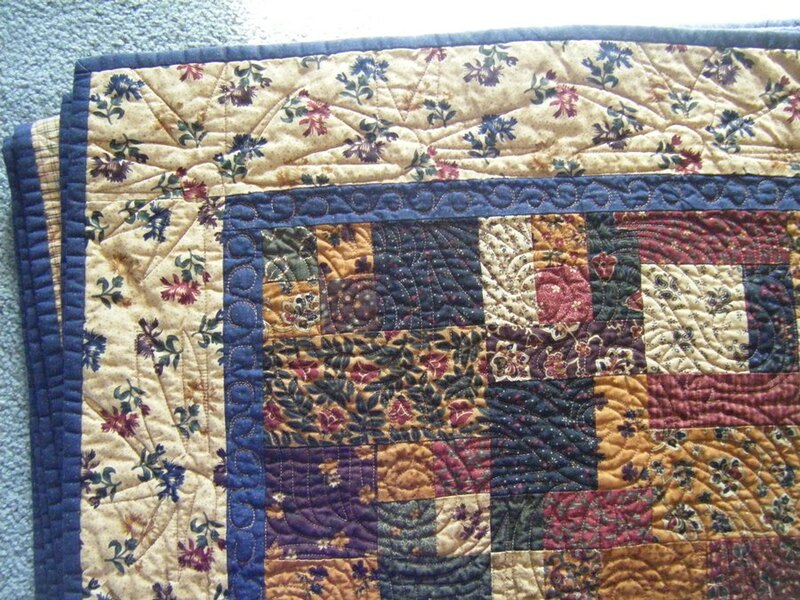 Tomorrow I’m going to load it on the long-arm and get it quilted. 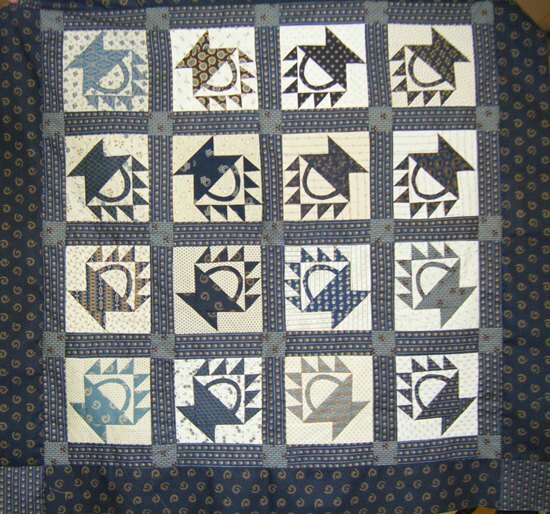 I love freehand quilting so much but must get in some pantograph work so that will be the project for this quilt. It finishes to 61″ x 70 1/2″. 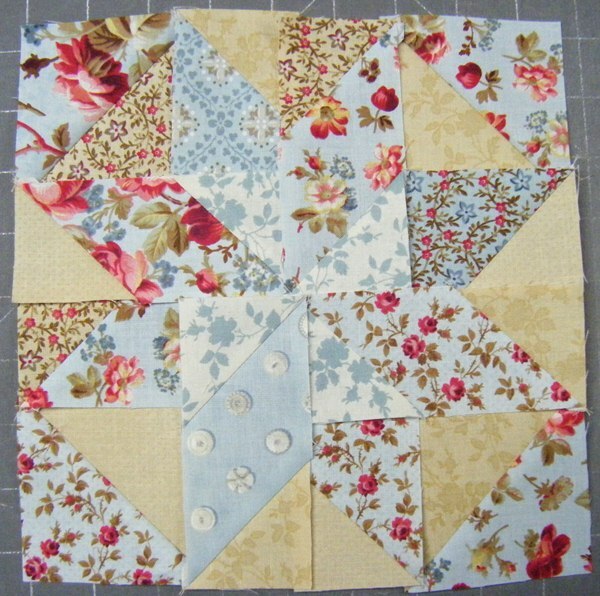 The binding will be the floral print like the border. I was excited to see so many friends again after such a long break. However, I had a job so I missed out on the hour of visiting once I got there. I’m heading up/organizing the raffle committee for this year’s project. Not that I wanted to head it, but the 3 that were willing to work on it are all new (and shy) and none of them wanted to be the spokesperson. Neither have any of them been members long enough to have participated in our last raffle quilt, 3 yrs ago. So I’m their voice. And their experience. After setting a tentative schedule for how we need to work and batting around a brainstorm of ideas, we are working on one thought now. The plan is to get a pattern set, then meet at a local quilt shop and buy the fabrics for the quilt. We’ll then assemble kits for the members to pick up at the May meeting. I think this is too much to accomplish by the April meeting. We’ll see how it all goes. Today I loaded the CD for the pattern onto my EQ program and was thrilled to have that done easily. We are considering 8″ blocks so I printed out the rotary cutting instructions to test them. I made the block this afternoon. I picked up my Round Robin for the next month. With all those canceled months, I’ve totally forgotten what I’ve done on the other quilts. 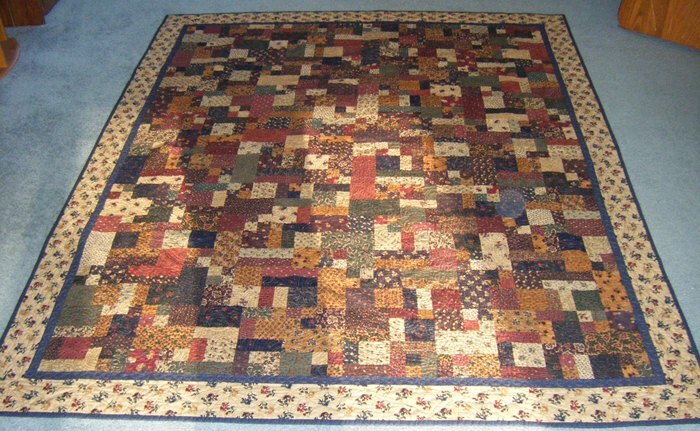 Then today someone that got the last quilt I worked on called asking about a fabric I had used. Very funny ~ I’m not even sure WHAT I did back in January! 😉 This month I need to add something with triangles. I’m thinking. 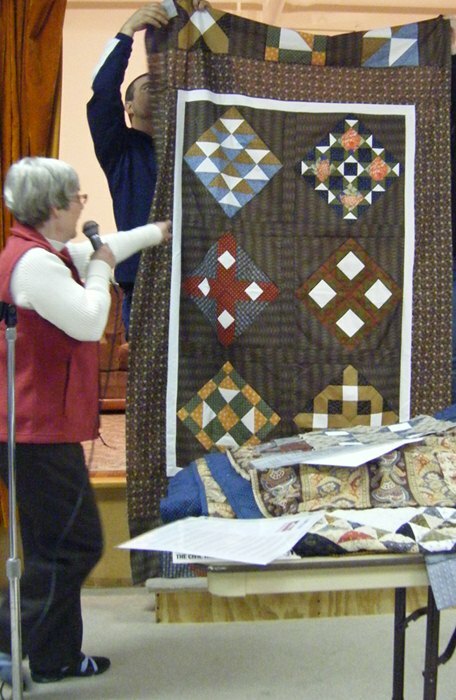 The program at guild was by a lady that owns a local quilt shop and her main focus is with Civil War Reproduction fabrics. She has interesting CW groups at the shop and gave great history tidbits with the fabrics and quilts. 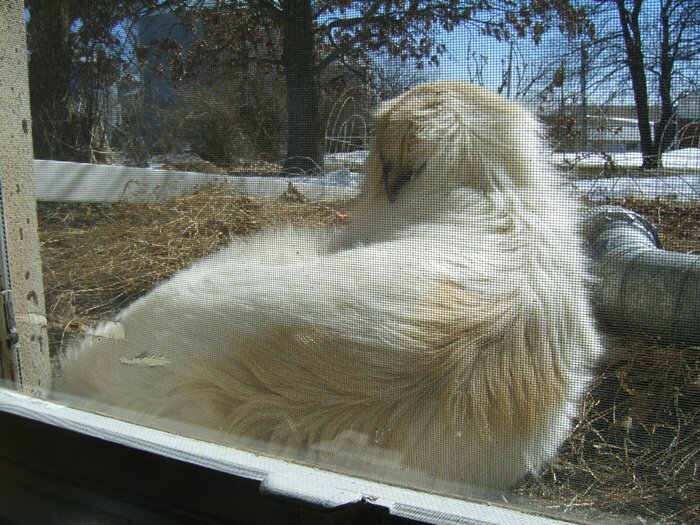 My photos aren’t great …. 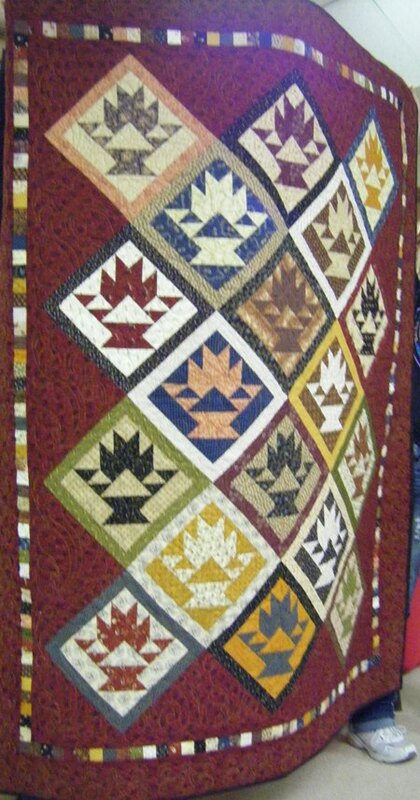 This is a cot quilt she made as a replica of the cot quilts made for the soldier’s in the Civil War. Long & narrow. 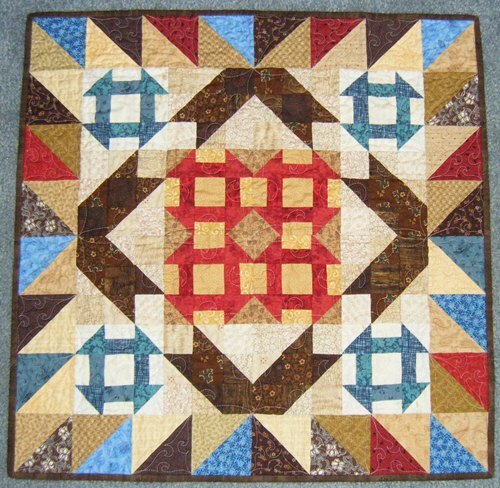 She used a 12″ block in the border and then the companion 6″ size times 4 blocks in the center of the quilt. Refreshment time gave me a few minutes to catch up with a dear friend 🙂 and then back for the business meeting and show & tell. I took my November LaPetité project that I quilted in January (domestic machine) and my 2nd quilt off my long arm, Scraps of Kansas, now with binding and washed & dried. 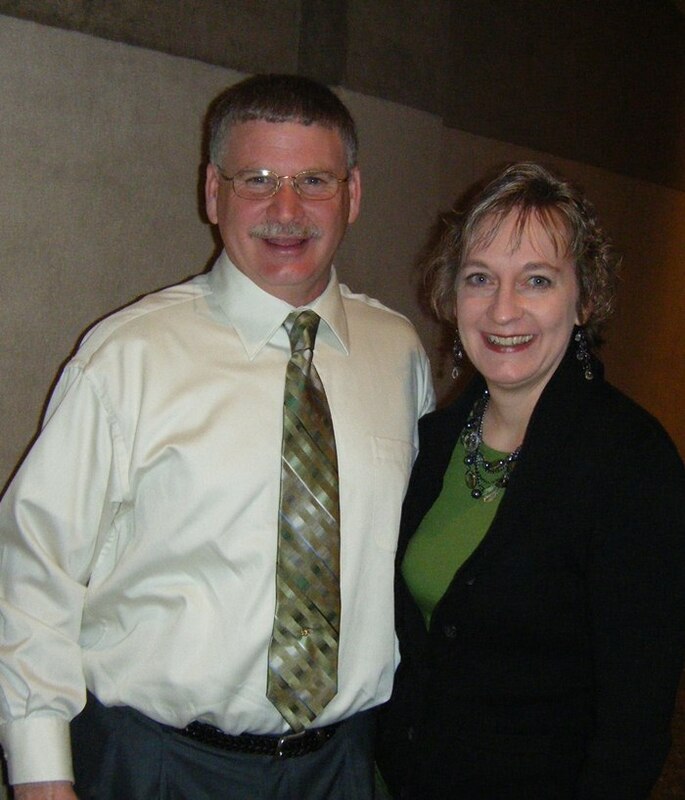 Friday night we attended a fundraiser for the ministry where Phil served this winter. The first item on the schedule was a Dessert Auction! I’ve never been to one of these and this was amazing! 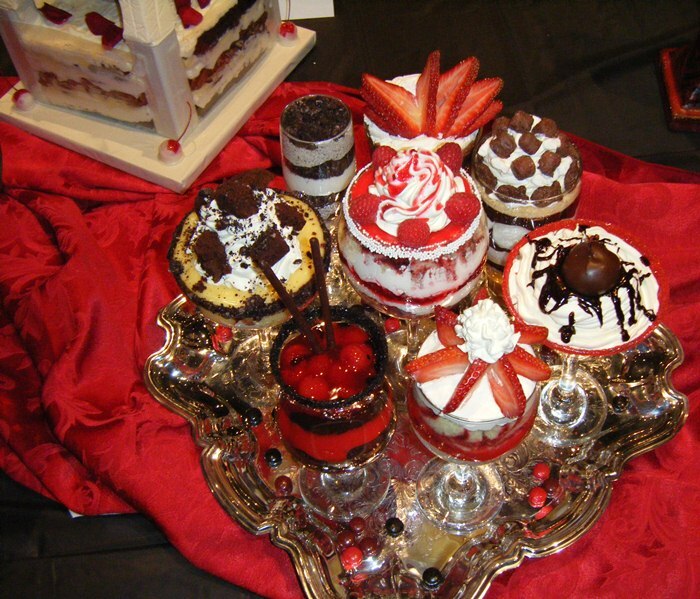 Several had worked and donated desserts. THIS is what we saw as we entered the auditorium! 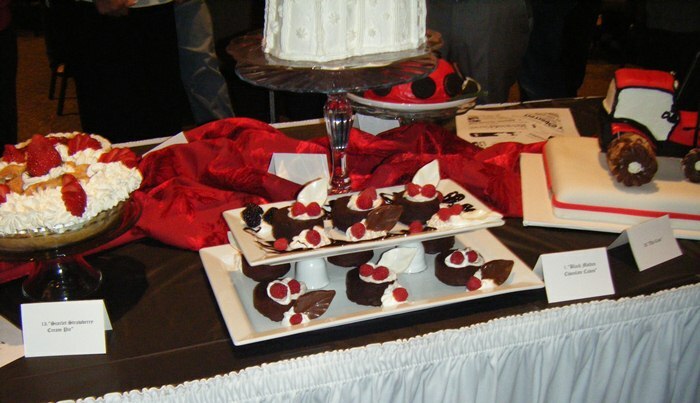 The tuxedo strawberries in the front of the above photo sold for $175. 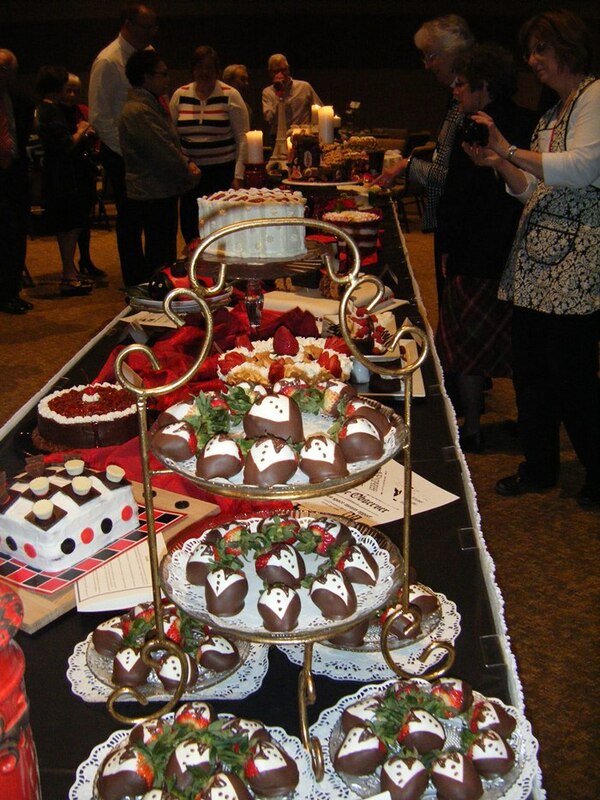 In the center of this photo are Black Molten Cakes made by friends of mine that sold for $150. To the left is Scarlet Strawberry Cream Pie which sold for $350. Nuts About Music! (above) looked sooo yummy and sold for $300. Most of the sales were for the whole table that pooled their money for bid money. It was quite fun to watch! Our table pooled together $460 and ended up buying 2 desserts. We bought this Brownie Berry Pizza which was very rich & gooey for $260! 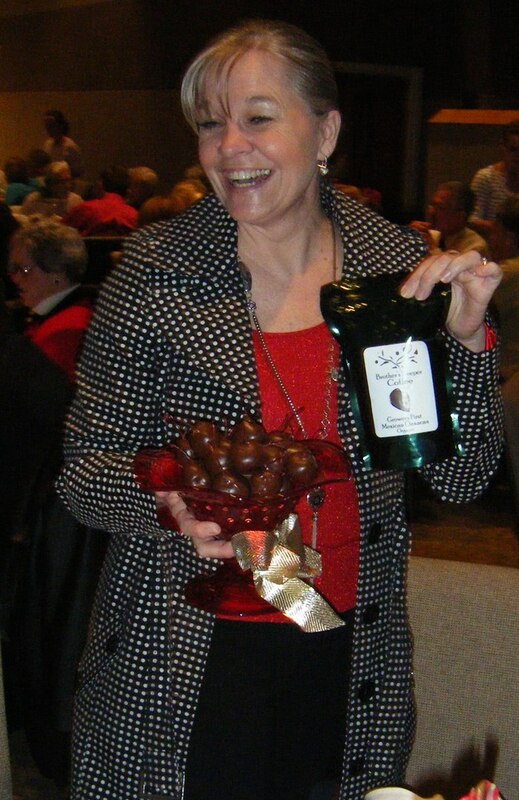 Then we added this bowl of homemade chocolate covered cherries and a bag of coffee for a mere $75. I don’t know who ended up with the coffee treat! We still had a bit of our money leftover so had pitched it to our neighboring table (mostly pastors) in an effort to ensure they could win a bid. However, it still wasn’t enough. 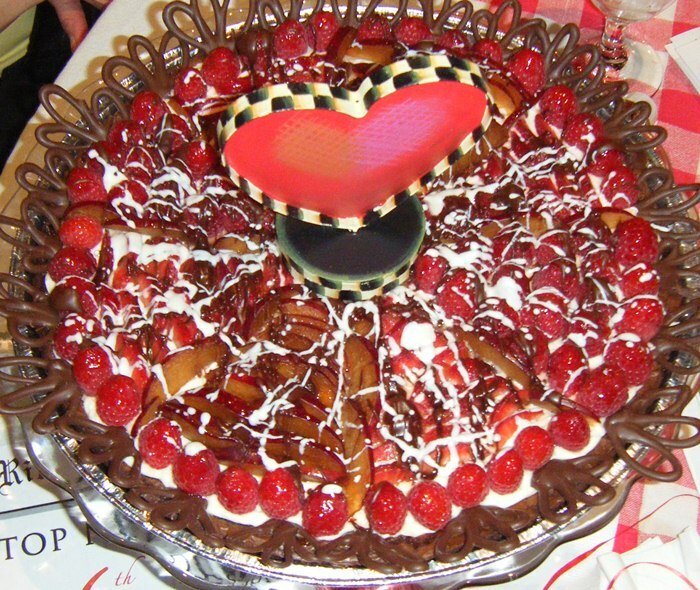 Thankfully another table bought the pastors’ table a Black Forest Cheesecake! That final bid was $575 as the last dessert sold. 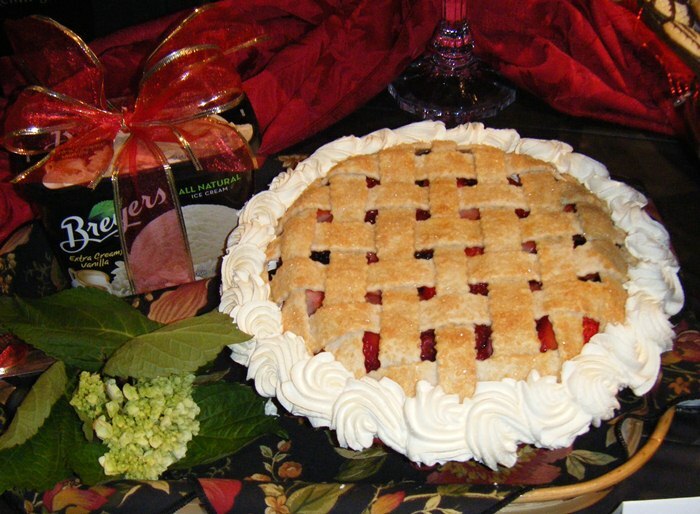 Triple Berry Pie — ohsoyummy! — sold for $550. Aren’t these parfaits cute!! They could have been yours if you had upped the $675 bid. 🙂 The Eiffel Tower in the back left corner (and in the photo below) was a masterpiece! 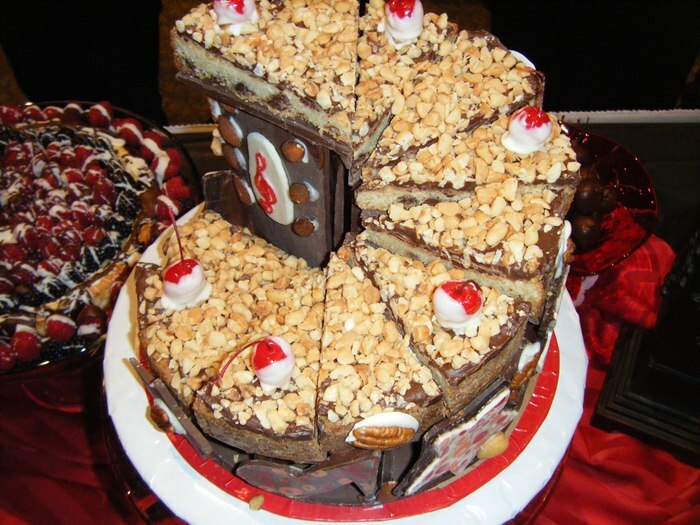 The bottom held a French Chocolate & Vanilla Cheesecake but the white chocolate tower surrounding it was SPECTACULAR! It sold for $360. All of this was in great fun. After the auction, we enjoyed a FANTASTIC dinner of Prime Rib! Yum!!! The youth group served us and it was just wonderful! 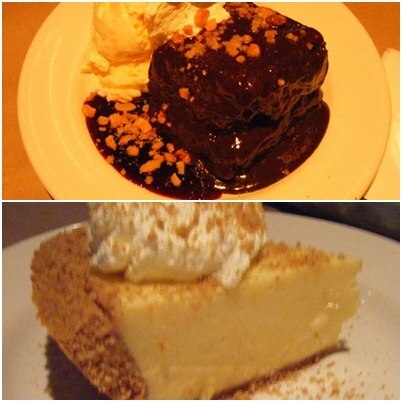 When it was time for dessert, we claimed our winning bids. Once the table was served, the extras were shared around the room. Phil got a piece of white cake (his fav) with strawberry filling and I got a tuxedo strawberry. Plus we had our brownie pizza and Phil was THRILLED with the homemade cherries! 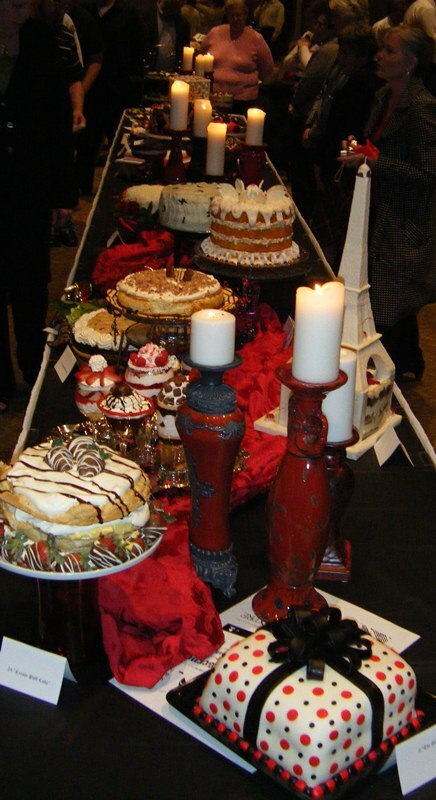 The theme was Black & White and Red all over…. you’ll notice the theme in the decorations. Not having a thread of red to my name or in Phil’s tie closet, we added green to our black & whites. In probably a dumb idea, I started a new quilt. In my defense, it is for my March LaPetité group so that has to count for something, right? On the other hand, I decided to make more blocks so that with some “plain” blocks alternating with these pieced ones, I can have a larger quilt. Because if you’ve been here, you know I don’t need anymore wall hangings! I cut and sewed up 3 sets of parts to make the blocks. This is just a mock-layout of a block. Tomorrow I can sew the blocks together. 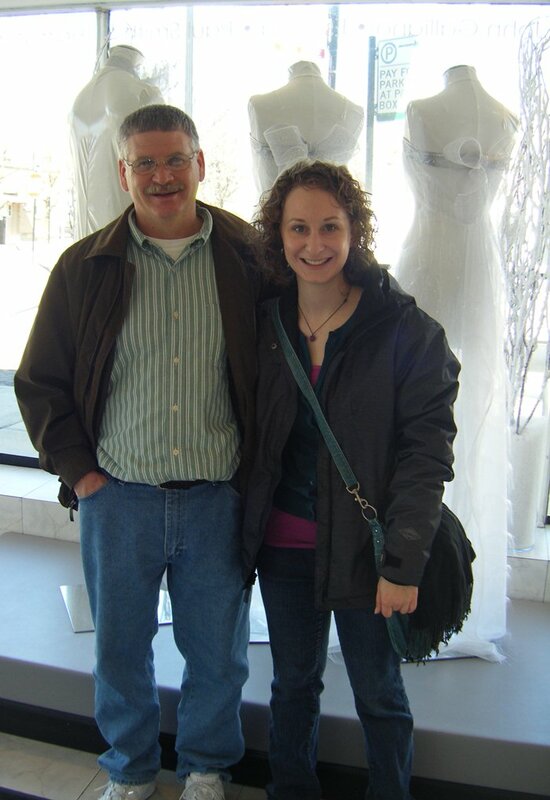 After seeing her work, we headed downtown. 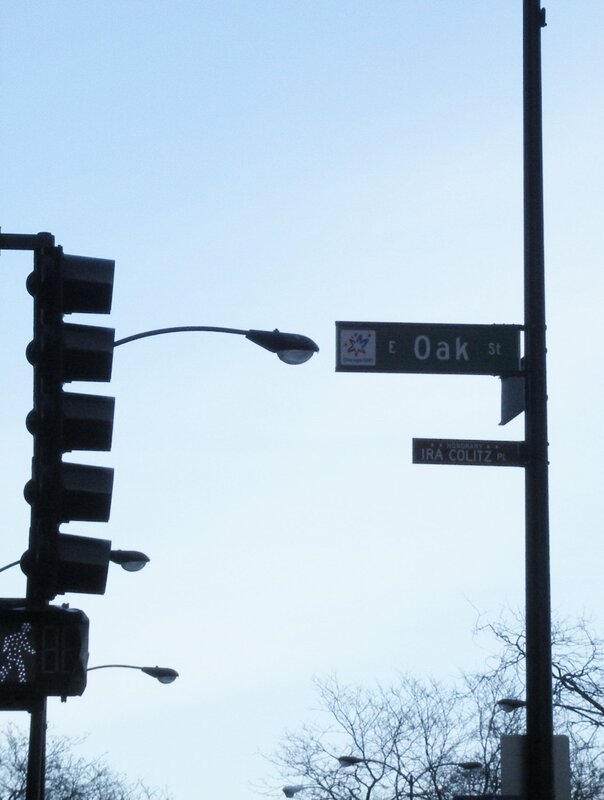 To the Magnificent Mile to be exact. 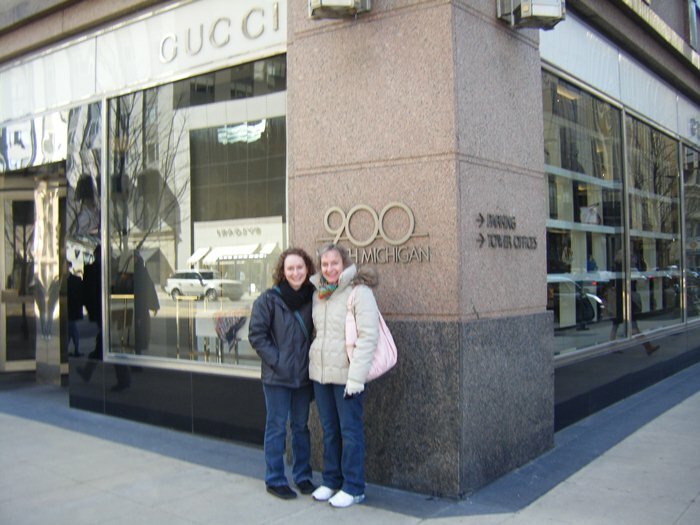 When she was downtown for school, we had walked in a few blocks but hadn’t gotten as far as the Hancock building & Water Tower Place yet. 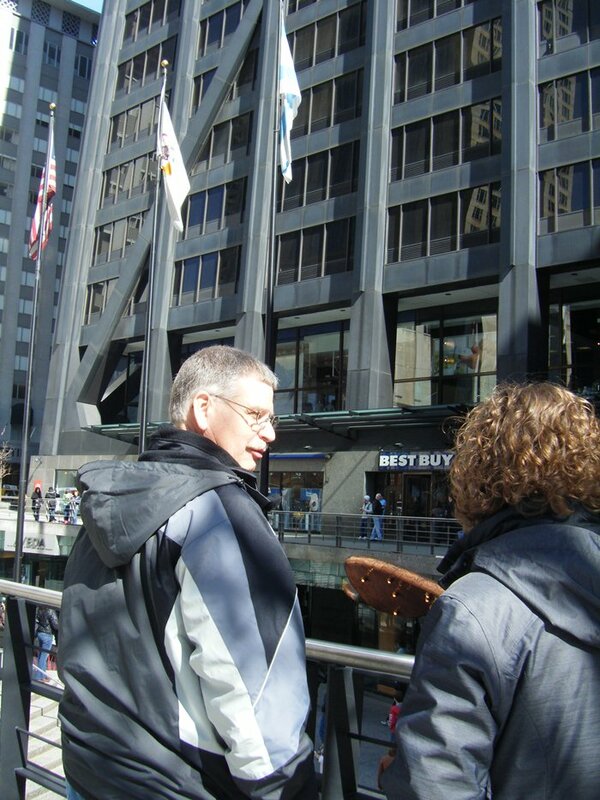 My uncle used to live on the 12th floor of 777 Michigan Avenue and had given me my first exposure to Chicago. So I asked for a photo op for him. It was sunny, low 40′, but the usual wind off the lake was breezy!! Lunch in the food court of Water Tower Place thanks to our guide! 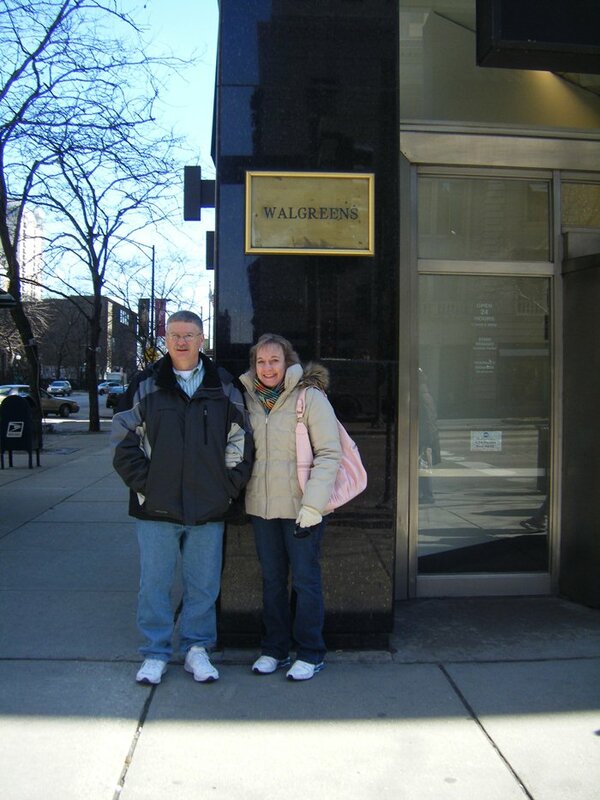 P & K in front of the Hancock building. We didn’t go in or up to the top. 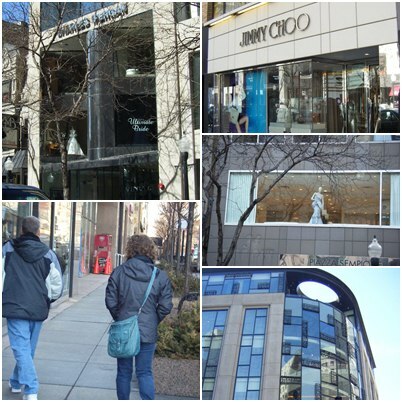 Many of K’s clients shop on Oak Street so she showed us the shops! 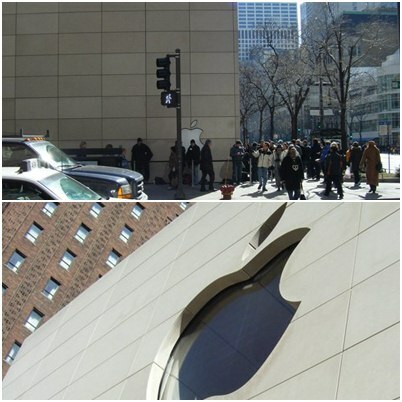 One of K’s part time jobs after college was in this mall at 900 N Michigan. After our walking downtown, we spent some time at K’s apartment. Phil watched a movie and K & I took naps! 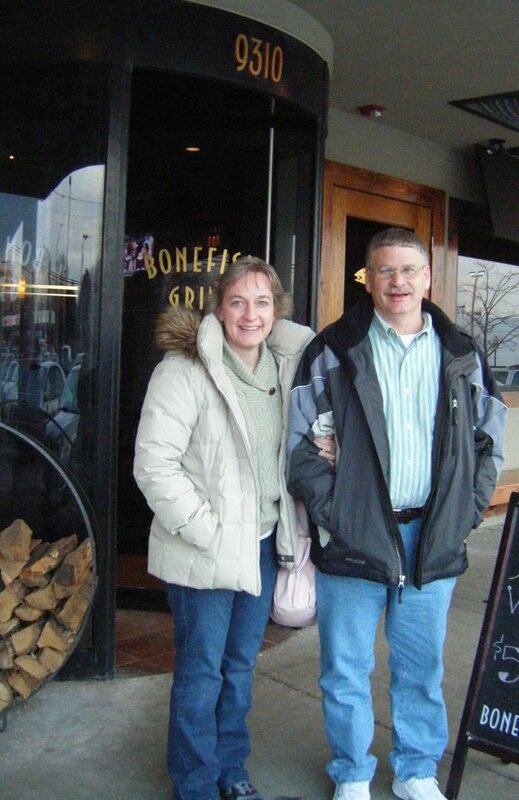 We headed northwest for supper at Bonefish Grill!! None of us had ever been there but Phil heard them talking about it on WGN so this was his pick for his birthday dinner. YUM!! We even got desserts! K & I shared a warm flourless brownie with a filling and chocolate sauce and raspberry sauce poured on top. Phil had Key Lime Pie. That was some of the best food I’ve ever had so I hope we can go back sometime. A few weeks ago, Phil said he wanted to go to see K for his birthday. “IF” she would have that Friday off of work, we could even show him where she works. (Friday is her normal day off but it doesn’t always happen that she is really “off”.) By Weds of last week, we had the all clear that she’d be off so we continued our plans. This is the view from her front door hallway. It is feeling more & more homey all the time. After we went home, she added her new green nightstand to the room, too. 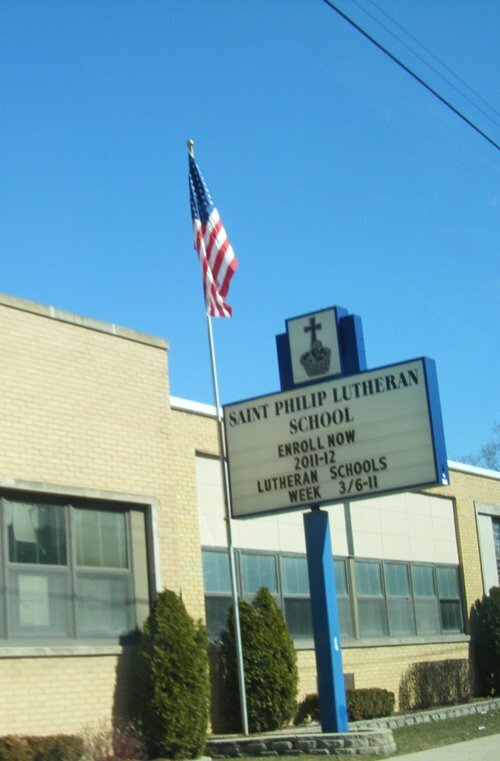 And passed Saint Philip School! LOL!! 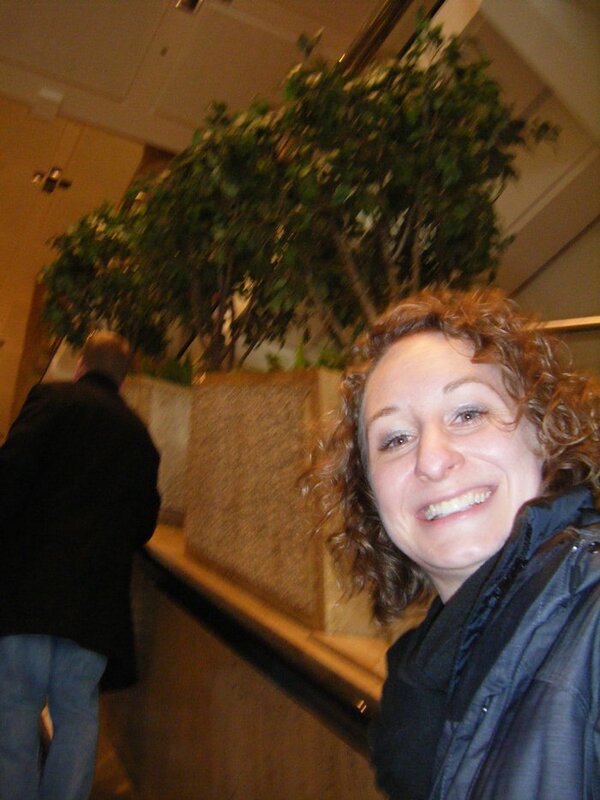 She found those throughout the plant that work for her in the wedding department and gave special introductions to them. Her specific presser, the one packing veils for preservation, the receptionist. I’ve not had a sore throat (much, just 2 hrs worth) today. I finished one quilt and barely started another. A long struggle to piece the backing. I do not like getting backings ready. 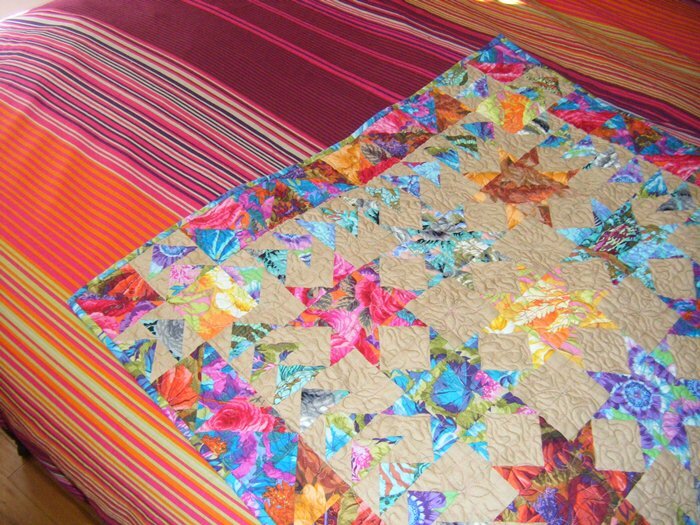 This fabric had been saved for this quilt. I don’t know why it wasn’t enough! Phil replaced the damaged rails on my long-arm today with the new ones that came last week via a different carrier. It made me nervous. He wasn’t at all. It wasn’t hard for him. Yeah!! I made K bored while I had my bluetooth in to talk to her and basted a quilt at the same time. Sorry! I can’t guess time today. The camera is downstairs. I forgot to take photos of the previous quilt. The Chicago trip photos are not on the computer yet. I have a long to-do list for tomorrow. I got an upset stomach watching some video from Japan. How awful! Nina found the place where Molly used to lay. This is my view from my newly cleaned studio window. Those are my thoughts. What’s on your mind?